Sometimes you set a campaign and Woodpecker shows it as “running”, but there seems to be something wrong. The second most common cause for this besides email not being properly connected to Woodpecker is timezone settings. 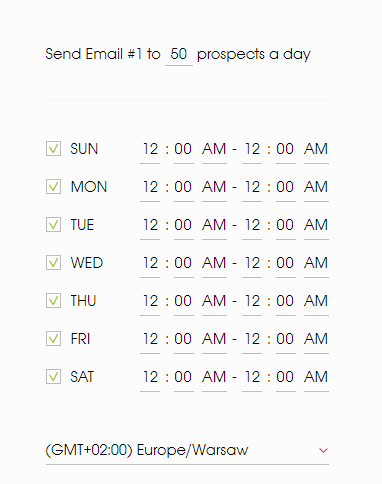 The Delivery Time customization is meant to give you control over the time when your prospects will actually get your cold mail in their mailbox. It might be especially useful if you and your prospects are a few time zones away. It is pretty easy to set. You set days and hours during which the given email will be sent. By default, it is set to 24/7. You can also set the timezone, and what is important is that it relates to the recipients! Quite often we get questions like: “My campaign is set to be sent 1.00pm - 5.00pm. It is 2.00pm and no mail got sent. What is wrong?” More often than not a quick glance at the time zone setting reveals that, at the recipient’s place, it is actually a couple hours before scheduled sending time. Also it is worth remembering that The GMT +/- settings relate to GMT+00:00, so for example if I am in Poland, that is GMT+02:00, and I want to reach somebody who is in Pacific Standard Time (PST) zone, which is GMT-07.00 the difference between us is -9 hours, not -7 hours! This might seem obvious but happens to be overlooked.